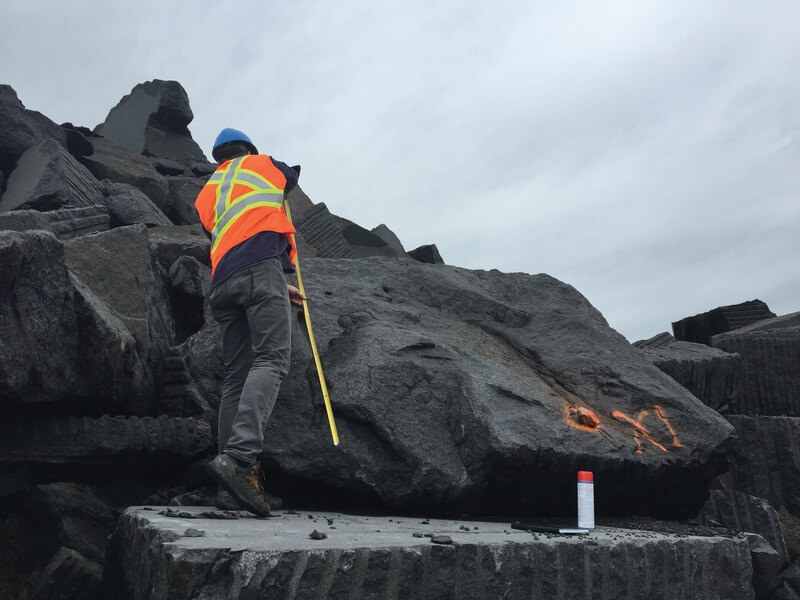 PICTURE COURTESY ROBERT CRAM: A Quebec quarry worker marks granite destined to become part seating, part art installation in four parkettes set to launch on Bloor Street in 2018. Humans have been moving stones to create monuments since at least prehistoric times, an act that is taking on a very local incarnation, thanks to the Bloor Annex Business Improvement Area, which is installing four parkettes along Bloor Street between Spadina Avenue and Bathurst Street. Placed at the rights-of-way at Howland Avenue, Brunswick Avenue, Major Street, and Robert Street respectively, the parkettes will provide many user-friendly amenities like a water bottle refilling station and stone seating made of granite sourced from Quebec quarries. Part art installation, part seating structure, the granite is meant to bring a more human aspect to the landscape, explained Robert Cram of DTAH, the Toronto-based architecture firm responsible for the design of the parkettes. The granite stones, reclaimed off-cuts, weigh upwards of 10,000 pounds and are 2 to 4 feet tall. Cuts to the rocks for seating are specifically being carved with care by Cram. “The concept for sculpting the stone came from [Isamu] Noguchi, the Group of Seven, and other people who have done these simple techniques into stone,” said the designer, whose design will give each stone “a beautiful modern look that will complement the history of the layers the stone already has”. Brian Burchell, chair of the BIA (who also publishes this paper), is spearheading the $1.8-million street revitalization plan that includes the parkettes project, said he believes “they will soften the area, creating spaces that are relaxing and non-commercial; an oasis in a very busy landscape. “From a park point of view, [the goal is] to have an integrated public art landscape, not something plunked down in the site, [but] something that becomes part of the site, [and] something that will work at all different times of the year,” said James Roche, a partner at DTAH, which has worked with other BIAs on similar projects. In the end, Cram believes that these parkettes will give a sense of connectivity unlike anywhere else in the city. Work on the parkettes is expected to begin in 2018.